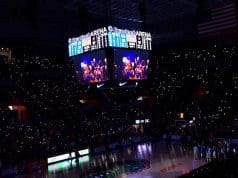 during the first half as the Gators lead 40-20 over the Vanderbilt Commodres in Exactech Arena at the Stephen C. O'Connell Center in Gainesville, Florida. December 30th, 2017. Gator Country photo by David Bowie. Florida desperately needed a bounce back game at Auburn on Tuesday night in the first of a tough road stretch. The Gators were just never able to get it going as the Tigers’ fast-paced style won out. Florida scored the first points of the game, then again went up by one just after the first media timeout. Little did it know that would be its final lead in a 76-62 loss. Auburn imposed its will early, turning Florida over five times within the first nine minutes. Still, the Gators were down just 20-17 at the midway point of the first half. Just three minutes later, Chuma Okeke and Samir Doughty led the Tigers to an 11-point lead. A jumper from Dontay Bassett and a three from Noah Locke brought it back within six, but again Auburn was back up by double digits with two minutes remaining in the first half. After Jalen Hudson hit a jumper with 1:17, the Gators ended up with a chance to take the final shot of the half. KeVaughn Allen drove to the basket with the seconds ticking off the clock and got it off just before the buzzer. Although it seemed Florida had been so overmatched early, it went to the locker room down just two possessions 36-30. Keyontae Johnson got to the foul line to open the second half, and just like that, it was 36-32. From the end of the first half to the start of the second, things were finally swinging Florida’s way a bit. The momentum didn’t last long as Auburn proceeded to go on a 13-2 run and took a deflating 15-point lead less than five minutes into the half. Deaundrae Ballard tried to pull his team back in it with back-to-back three pointers (one from way downtown at the end of the shot clock). That made it 49-40, but as it had done all night, every time Florida seemed to turn a corner, Auburn pulled something else out of its sleeve. The closest the Gators would get the rest of the night was within eight points thanks to a strong showing by Kevarrius Hayes. The Tigers had their largest lead (67-49) with 8:28 remaining. Despite Florida’s defense holding Auburn nearly seven minutes without a field goal from that point, the offense could not take advantage. 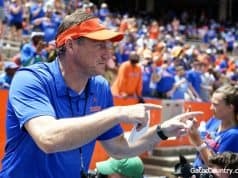 Aside from the loss to FSU in the first game of the season, the Gators have been right there at the end of every game, but the Tigers cruised in the final minutes of this one. Florida shot just 36 percent in the second half after shooting a 56 percent clip in the first, but Mike White was most troubled by his team’s defensive performance. Auburn is the best three-point shooting team in the league, and so many of its nine triples on the night came in big moments and were difficult to overcome. The Gators allowed the Tigers to win the turnover battle as well as they gave it up 17 times. Allen struggled to take care of the ball with six, Johnson turned it over five times and Andrew Nembhard had three to just two assists. Once again, Florida played without much production from its two best offensive players. Both Allen and Locke finished with 10 points, but Allen couldn’t come through when the Gators needed him and Locke disappeared after the first half. Locke scored all of his points in the first 20 minutes as he made 4 of 6 shots and both of his three-point attempts. He only took three shots from that point on. Meanwhile, Hayes scored all of his points in the second half and ended up leading the team with 11, going 3-for-4 from the field and making all five of his free throws. 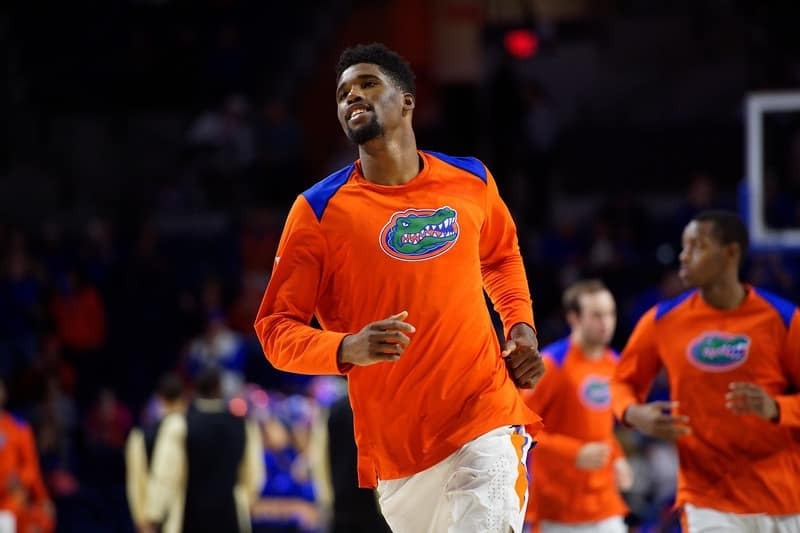 Johnson continued to be Florida’s best rebounder as he’s been in recent games, finishing with 10. 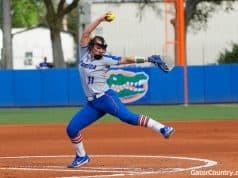 Before Tuesday, the Gators had won 11 straight over the Tigers (and 21 of the last 22), so a loss was bound to come sooner than later. But this team is so far removed from the one that blew Auburn out of the water on its home court and set a school record with 114 points just two years ago. There is nothing left to do but try to pick up the pieces and hope to find a way to stay competitive at No. 1 Tennessee on Saturday.